Currently in use as our funds charity shop the coach was built at Swindon works in 1934 to Diagram No C67, Lot 1509. 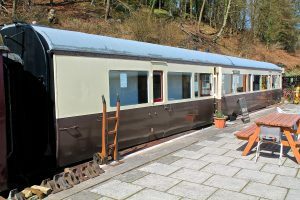 The vehicle was damaged by enemy action in 1941 but remained in service until 1962 when it was modified to accommodate communication equipment, a messing area and kitchen for the Ministry of Defence as part of an emergency Control Train, stored at Craven Arms. Purchased by a DFR member in 1980 it was eventually sold to the Forest Pannier Tank Fund in 1984. It is planned that once our other GWR Collett Brake Corridor coach, No 7362 is complete, No 5813 will come in for a overhaul to form part of the DFLG passenger train of authentic GWR coaches.